3. Classes: Teach your clients about what you do. Take +Yarn Mountain for instance. +Christina Blount Presnell has created a global, virtual Knitting Lodge. Even though her hip little yarn shop is located in Virginia, she crowd sources and finds global knitting enthusiasts via Google Plus and then invites them into a face to face encounter via webcam in a Hangout. Recently, we brought in two of our IT guys to share with +Veterans United followers how to Hack Proof their phones and computers. Find your experts and share their expertise. Some Hangouts called Hangouts on Air also stream live on YouTube if you wish. So if there aren't enough seats in your free virtual classroom (9 + the host), others can still watch it live. The session also automatically records to your YouTube Channel. 4. Office Hours: An open Hangout is an open door to conversation with your future customers. It's like a welcome sign in your window that says come inside and sit a spell on your Virtual Front Porch. Every weekday at 4pm Central, I host a "Virtual Front Porch" Hangout on the +Veterans United profile just to meet people, chat with old friends and talk about everything from the day's news to new digital trends. Don't know what to talk about? Give them a behind the scenes tour of your office space or take your laptop on the road and open the Hangout from an interesting location in your community. 5. Add Human Media to your Social Media Campaign. The Human Media Movement and Hangouts are the new roots anchoring social campaigns. No longer do you have to just interact with your customers via text based postings on social networks, you have the ability to talk to your customers face to face which is a deeper level of interaction. It's real time, living breathing human media and it trumps chatting with a person's avatar. As +Mike Elgan correctly points out, "Humans aren't designed to communicate with someone they can't see." These webcam interactions via Hangouts lead to a civility in communication and there's even science to back up the theory that people are nicer in person than they are on text based social media posts. You have to reason that phenomena also translates into a closer feeling with the people you interact with in person, even if it's via a webcam. On Twitter, people will say "I follow Sarah." On Google+, they say "I know Sarah." The difference? Face to face interaction in Hangouts. Do you want your customers to follow you............or know you? Whom would you rather do business with? 6. Improve Customer Service: With video cameras now standard on many mobile devices and with the "face time generation" highly familiar with video chat becoming consumers themselves, more people will become accustomed to interacting with customer service agents face to face versus phone calls. No longer do you have to listen to hold music. You can watch a video about the company on your smart phone while waiting to video chat with the customer service rep. Just like a bricks and mortar business where a salesperson greets you at the door and asks "How may I help you? "....in the future, a sales person or a "video concierge" could greet you at the Virtual Front Door of your website and ask you via webcam "How may I help you?" 7. Virtual Career Fairs: The emerging platform of Human Media is a powerful recruitment tool as it allows you to crowd source job candidates and interact with them face to face without having to fly a prospective employee to your office. 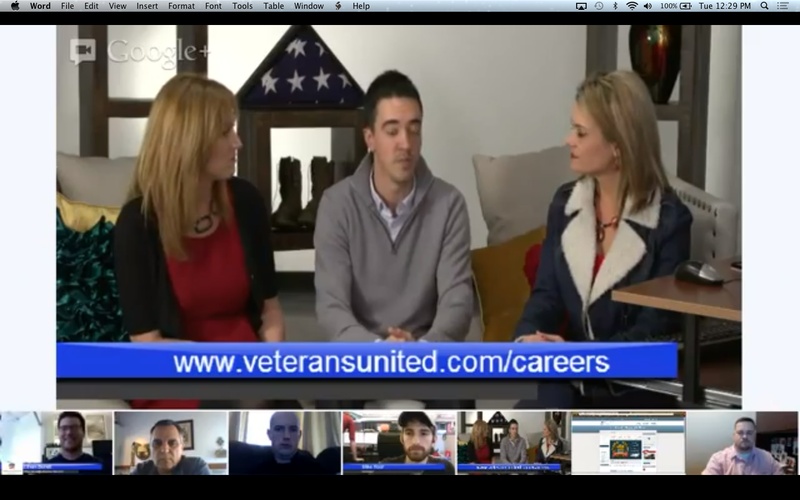 +Veterans United recently hosted a Virtual Career Fair via Hangouts On Air where the company was able to interact face to face with out of state job seekers. +VetNet HQ is also putting Veterans to work by hosting Hangouts that provide everything from resume writing seminars to fireside chats with employers looking to hire veterans. So what's ahead for you with Hangouts in 2013? I'd love to hear how you plan to use your free broadcast tower. Connect with me in my Human Media Movement Community or join one of my +Veterans United Hangouts by checking out our Hangout Hub Page . New to Hangouts? There are lots of great communities to answer questions for newbies. Please check out Hangout Rangers Community by +Mike Downes and +Billy Wilson 's Hangouts On Air Community. Both are moderated by experienced Hangers eager to help you let your "webcam do the walking. " wow - great article! So many great links to people really using G+ well. Thanks for taking the time to create this. Posting, sharing, tweeting and pinning. enjoy. Fantastic blog +Sarah Hill !